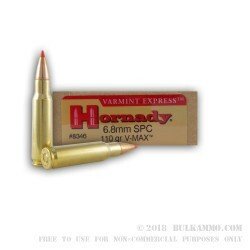 This load from Hornady uses the polymer-tipped V-Max bullet to turn your AR-15 into a formidable hunting rifle. The 100 grain bullet leaves the muzzle at 2,570 feet per second and achieves a muzzle energy of 1,613 foot pounds. The polymer tip of the V-Max design provides good stability and wind resistance and promotes expansion in the target. Each round in this box of 20 uses Boxer-primed brass cases. 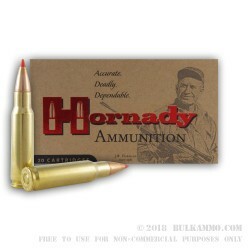 Hornady is a manufacturer of bullets and loaded ammunition for self-defense, hunting, and law enforcement. The company was founded in 1949 as a bullet maker and continues to supply many other ammo loaders with high quality XTP, V-Max, FTX and other bullets in addition to marketing its own loaded ammo. Hornady produces its ammo and components at a large facility in Grand Island, Nebraska. Q: What is the velocity of the 100 grain v-max polymer tip bullet at 100 yards, 200 yards, and 300 yards? Q: What is the maximum effective range of the 6.8spc round, and how much more energy does the 6.8 carry compared to the .223 and .308 rounds? A: Depending on barrel length, the 6.8SPC cartridge can be accurate and effective at 600 yards. 5.56 muzzle energy is between 1100 and 1300 ft-lbs, 6.8 SPC muzzle energy is between 1500 and 1700 ft-lbs, and .308 muzzle energy is between 2400 and 2600 ft-lbs. Q: Is this bras re-loadable and what primer should I use, I will be using AA2230 as a powder. 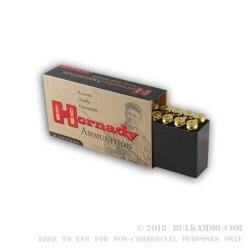 A: Yes, Hornady 6.8 brass is high quality and reloadable. It has small primer pockets.